Paper Size: 28" x 17.5"
We have largely forgotten the role of these daredevils in the T-6, but without the "Mosquitos" - a raging outfit of professionals of one stripe or another - the Korean air war might have been a different story. 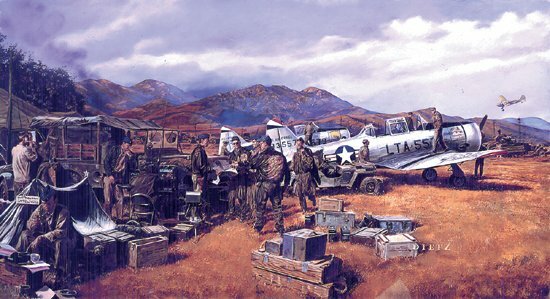 By the end of the Korean War, the 6147th Tactical Control Group lost 42 aircraft and 33 men. The Mosquitos flew over 40,000 sorties aiding in the destruction of 5 tank divisions, 563 artillery pieces, 5,079 vehicles, 12 locomotives and 84 bridges.